The PWay team continued with the base for the new tank in the fuelling point, leaving the concreting till a cooler day. The pot holes in the car park have been filled in with quarry waste which will harden when damp. Please keep the speed down when driving on the approach road. Thanks to Doug for this task. I can't ignore the Permanent Way Team who where putting the final touches to the bund for the new diesel tank where the heat of the day called a halt to the interior finish. A couple of photos from today as the narrow gauge railway contributed to the enjoyment of a school group as part of their time with us and the result of John Allsop's magic on EVRA's SK. Only open this if you like trams! A lovely sunny day ensured a steady flow of visitors to the railway as Iris and 55006 handled the morning and afternoon Services respectively. The Lmsca cleaned out the coaches and washed up after last nights successful Dining train . Down the yard The Dmu team did a FP exam on 55006 in the morning after its recent trip to Wales whilst the rest of the team carried out more renovation work on 50523. The 8f group were to be found drilling out the foundation plates on the Duke as Tim Oakes painted the frame. The Pullman Buffet and Model railway were both open for our visitors to enjoy. The five inch gauge railway underwent more work to repair the damage caused to the aluminium track as well as displaying the newly repaired locomotives. Many thanks to all staff who made it an enjoyable day. Not quite as sunny as recently but still warm. Once again lots of effort went in to the preparation of our second Shottle Soiree evening. Hours of cleaning glasses, folding napkins into flames and cutting melon ensure a top class experience for our guests. The Tannery Team continued to progress the new Booking Office at Wirksworth and have now cut the new desk top. That is the top of a desk not a computer. Also working hard were Team EVRA who replaced the rotten ramp top into their shop to ensure it is safe to use. Today's pics show the largely set up table for dining and the progress in the Tannery. Once again the sun shone on the last day of our 1950's Event which pleased the jazz band deciding to play in the open on platform 2. The Pullman Buffet have been producing 1950's lunches and today it was bangers and Mash with pea and ham soup. They had gingham table cloths and associated 1950's pictures. Thanks again to all who went the extra mile to show our visitors what the EVR is capable of producing. The DMU group were out in force having a very positive day declaring two out of three failed units fit for traffic. They completed a vacuum test on EVRA's SK and then positioned it in the MF for painting. Beveley & I went on last night's Murder Mystery Train together with two friends and I have to express my great pride in our organisation in it's ability to deliver a stunning and very entertaining evening. I know the hard work that went into the concept and planning and the large team that organised the event on the night. The weather was kind to us again today. Two warm days together in this Country is quite something !! The PWay team split into three groups. One cementing the crack in Duffield tunnel, one continuing lining the Fuel point walls and the other oiling and greasing all the ground frames and point work at Shottle. The DMU Group spent the day uncoupling all the units available to produce a new three car set for this evenings Murder Mystery land cruise. Today Wirksworth and Duffield Stations went back in time to the 1950's. Cars and motorbikes of that era were parked outside and a Jazz band played on Platform 2. Memorabilia was displayed around the Stations and passengers and staff dressed in the appropriate attire. 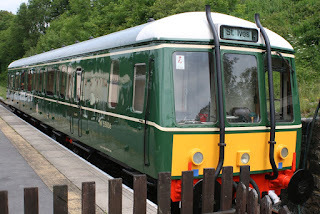 The Cream Train ran with 44 passengers enjoying our culinary delights. Down the yard the DST started to fix the new running plate on Catherine and were cleaning the threads on the handbrake. Delightful to see the June and the team getting into the 50s spirit. Of course it's not an era I can remember but my dad told me about it. However, a word that Mr Gove doesn't like starting a sentence but I think it's all right, the Cecil de D Miller studios have produced another masterpiece of the Afternoon Tea Train at Idridgehay. Enjoy! As they say "... when a plan comes together........."
A quiet Thursday with most of the DMU Group at Llangollen ensuring 55006 behaves itself in foreign lands. 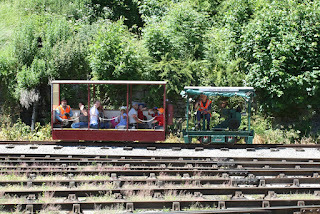 They usually take advantage of Thursdays when the PWay have a day off and they can shunt and fuel the units without affecting the track work maintenance. Our website wizard besides acting as Drivers Assistant on the Diesel roster decided to empty the oil separator and remove all the silt. I have actually never seen the concrete base before. Not a job for the feint hearted !! Iris once again pottered up and down to Duffield giving our passengers a wonderful view of our Derbyshire countryside. A track patrol between Gorsey Bank and Ravenstor was successfully completed. 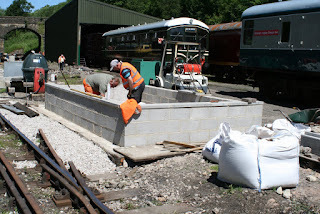 More blocks were laid on the new fuelling point. The LCC was seen to be erecting an awning with help from other volunteers ready for our 1950's event next week. 55006 eventually left about 1700 for Llangollen. Duffield had a spruce up today with lawn cutting, vegetation trimming and a picnic table repaired. The DST repaired Henry Ellison's steam valve and gave it some spit and polish ready for the first Friday evening soiree. all six of these dining trains are now fully booked. The afternoon cream tea train ran again and with each one the catering staff get slicker to ensure the passengers get correctly seated. 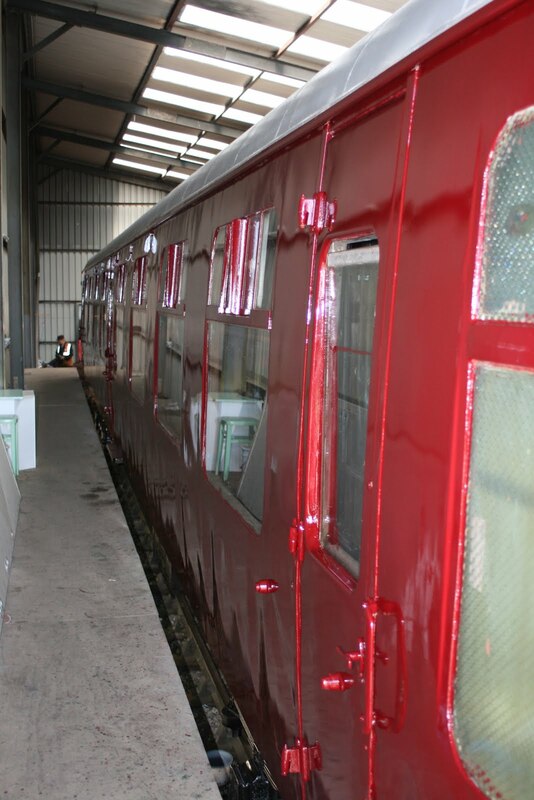 Today's photos show the "Bubble Car" glowing with all the attention lavished upon it prior to its departure tomorrow to take a star role at the Llangollen Railway this weekend. It is a tremendous tribute to all the team who have lavished so much care on the vehicle. I am promised that the destination blinds will reflect its current home! Also shown is "Fred" of Fred and Iris fame who, between them, have cleansed our Mess Hall and refreshed our planters over many years - unsung heroes! 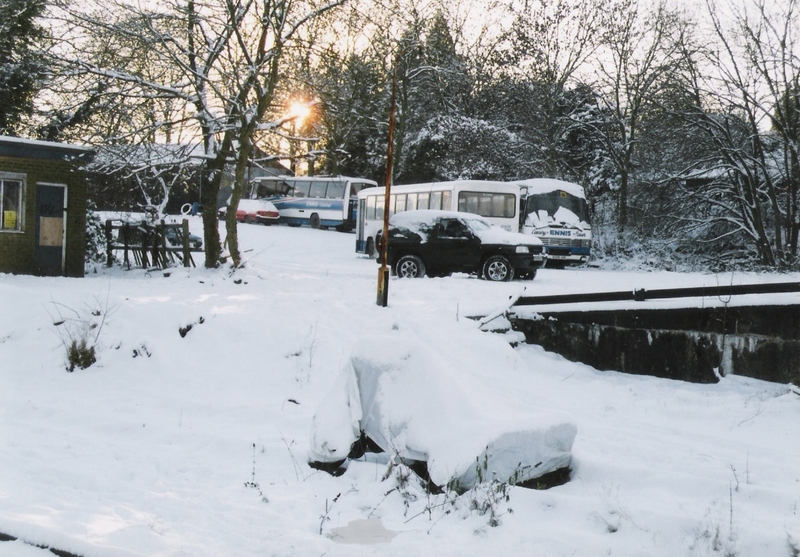 Lastly, in the office handover to the new Managing Director an "old" photo was found showing the late, unlamented, Ennis Coaches with Phil's troublesome Freelander at an early stage in our development. Inevitably there is a video short for you from the site of the canal aqueduct site at Sawmills. Difficult to imagine the Cromford canal soaring above the Midland Main Line and road but one day it might be recreated! A day which started sunny and warm is now looking like there might be some storms on the horizon. Anyway, it stayed dry for our 4 Drive a Diesel experience guests who sampled a 101/108 hybrid in the morning followed by 33103 this afternoon. Lunch was provided by Ann in the buffet and the two Johns played host. 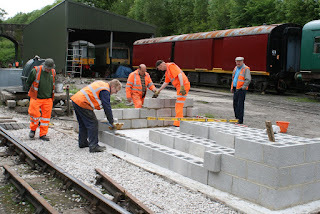 A small team of PWay guys continued building the new bund wall down the yard. Foreman Stuart spent most of the day repairing a station gate which was showing signs of rot, whilst Foremen Brian and Martin continued working on the new Wirksworth Booking Office. The attached photograph shows progress so far and whilst it is not yet a finished product it shows great developments on what will eventually be the 'front desk' serving positions for the Booking Office Clerk. EVRA did a spot of light painting on the wooden rails that lead up to the shop and also the replacement handrail for the lamp van which had gone rotten. Driving up the valley I glimpsed Iris and it was too good to miss! 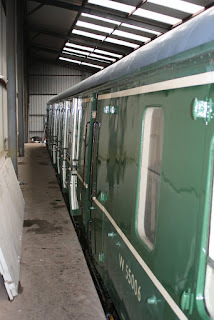 The DMU team produced another two car set requested by a party travelling on Saturday. They also commenced the A Exam on 55006 required before its travels. 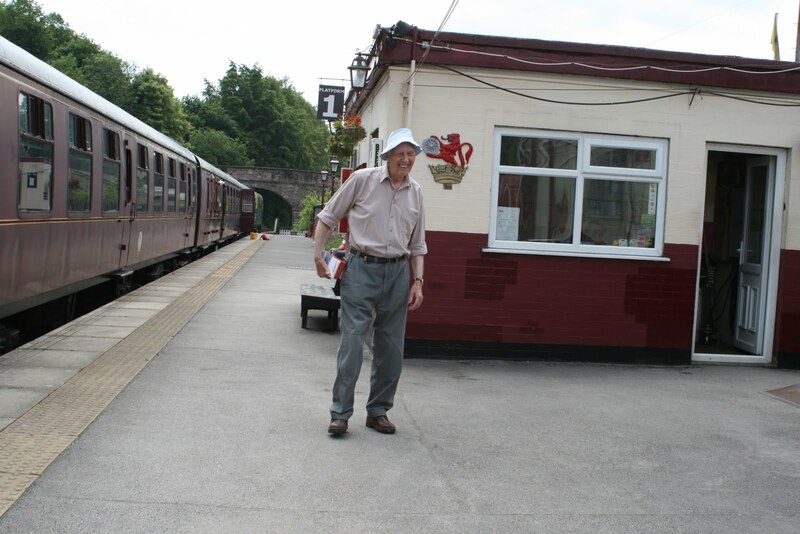 Our service train was easily handled by Iris and the Pullman Buffet was covered by John Evans who seems to be able to cope with any position. My thanks go to him and also Chris Beale who covered the third mans position again. Another busy Tuesday at Derbyshire's longest Heritage Railway. We ran another successful afternoon cream tea train using three MK1 maroon coaches which certainly looked better than hauled DMUs for the passenger stock. The PWay had lessons in brick and block constructing the walls on the new fuel point. Another team continued painting the North Shottle ground frame. The DST split into their usual two groups fettling No3 and Henry Ellison and moving Catherines restoration forward. A delivery of reclaimed track and chairs etc was seen arriving from Spondon in the afternoon. 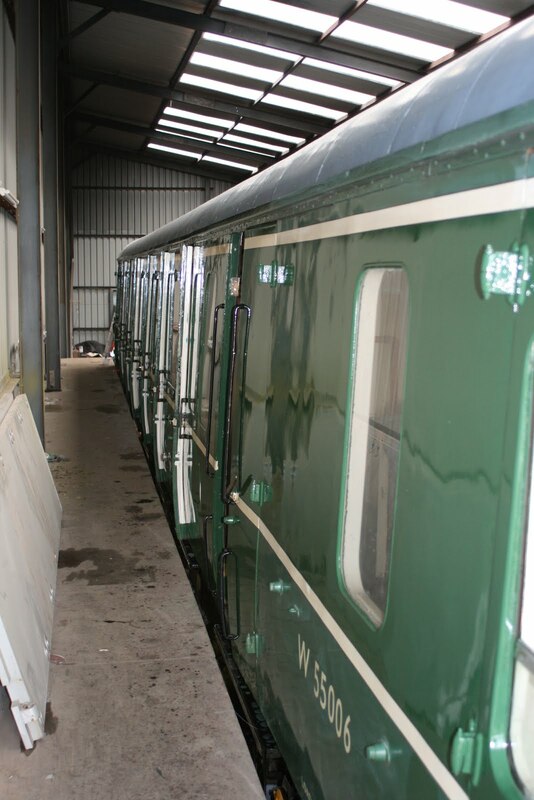 The photos illustrate the Permanent Way Gang constructing the bund wall for the new giant fuel tank to be installed for the diesel fleet and the results of John Allsop working his varnishing magic on the "Bubble Car". As you would expect there are another couple of videos for you. The first is a very, very short piece of poor quality film from the Hopton Incline on the last day of the Cromford & High Peak Railway and the second is a little whimsy from north of Belper. Another Cecil B de Miller production celebrating our two main line diesels at Ken Rowland crossing today. My tour of Wirksworth is attracting an appreciative audience! Just shows retirement enables flights of fancy. The Service train passengers reacted to the hotter weather and better numbers than yesterday were noted. The PWay team over the week have erected all relevant permanent speed restriction signs and removed temporary signs at Shottle.Installation of the down starter was also completed and further painting of the north ground frame. John Allsopp worked some more magic on 55006 paintwork before its travels and the DMU Team did the usual shunting before the Weekend Diesel Gala to ensure Platform 1 is available for run round moves. At last the sun decided to stay with us most of the day even though we had an early shower whilst I was checking a tree up the incline which one of neighbours had requested we felled it. Wednesday is stock cleaning day and the LCC gave 50599 our incline vehicle a thorough spruce. Our lone DMU member repaired a droplight in the guardsvan area of 51073. 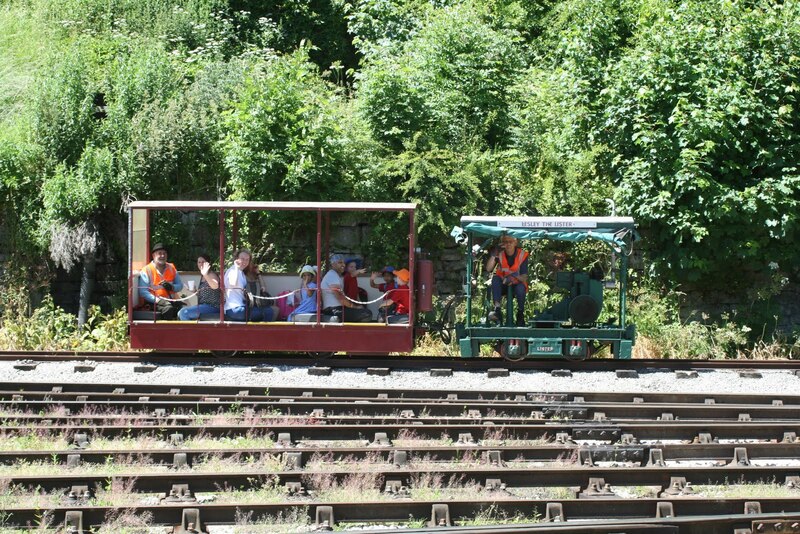 It was a quiet day on the service train which is were our single railcars become economical. Today saw the first of our afternoon Cream Tea trains hauled by newly arrived class 33 Swordfish. Good reports were received from the passengers regarding quality and presentation of the food. Thanks go to everyone involved in making this a successful experience. The PWay team continued erecting a metal fencing on the Narrow Gauge under Cemetry lane bridge to ensure there is a secure area to stable the steam engine which will be visiting in July/August. The DST applied more paint to Catherines frames and Henry Ellison and No 3 were transposed to equalise workings. 52 volunteers and staff signed on today for duty. I wonder if any railway of our size could compete ?